1) The formal perfection of Camellia Mimosa Jury – the cultivar bred by Felix Jury which we rate as his very best. 2) Mark’s Monarch Rescue Centre and other garden tasks for the week. 3) While we certainly don’t have gardening conditions that resemble its native habitat of sand dunes, Aloe thraskii shows a tolerance of wide range of condtions. 4) Outdoor Classroom this week is a step by step guide to pruning hydrangeas. Macrophylla hydrangeas. When Daphne bholua, the Himalayan daphne, first became available here, it seemed liked the best thing since sliced bread and we gathered every form we could find. While it remains a valued plant in our garden, it has not proved to be such an all-round wonder plant as we had hoped. After a few years, it can look pretty scruffy and its habit of being slightly semi-deciduous doesn’t help because it doesn’t drop its spent leaves early enough. Added to that, it sets seed so freely that it pops up throughout the garden to the extent that one can see some element of noxious weed about its ways. And it suckers all round the parent plant. But of all the daphnes, it must have the loveliest scent and a single plant can waft that fragrance metres away. And when that happens on calm days in the depths of winter, all is forgiven. 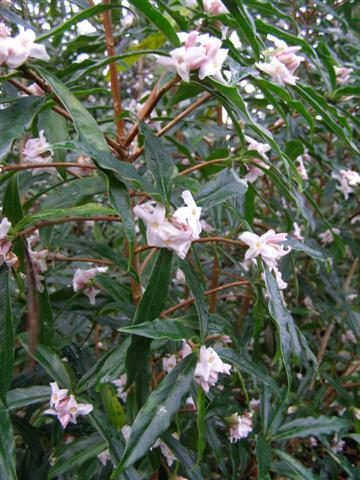 This entry was posted in Tikorangi notes and tagged Daphne bholua, Himalayan daphne on 25 June 2010 by Abbie Jury. I’m in Oxford, Canterbury, where we had -9.1 this winter. I love having something that flowers in the depth of winter but this shrub has always been a bit scruffy. I certainly haven’t had any problems with seeding or suckering though. The birds spread the seed here, far and wide.